Listen I know here in the States when July 4th rolls around everyone becomes totally unhinged for the summer barbecue to end all barbecues. Bitsy and Bobby Ray want you to hang out on their dingy. Your mother-in-law insists on making mountains of German potato salad, and your kids whine incessantly about how they want to go their friend’s pool party. So how do you throw a party when you are tired of everyone? Well you combine all three fiesta’s in one and celebrate the way the founding fathers intended. 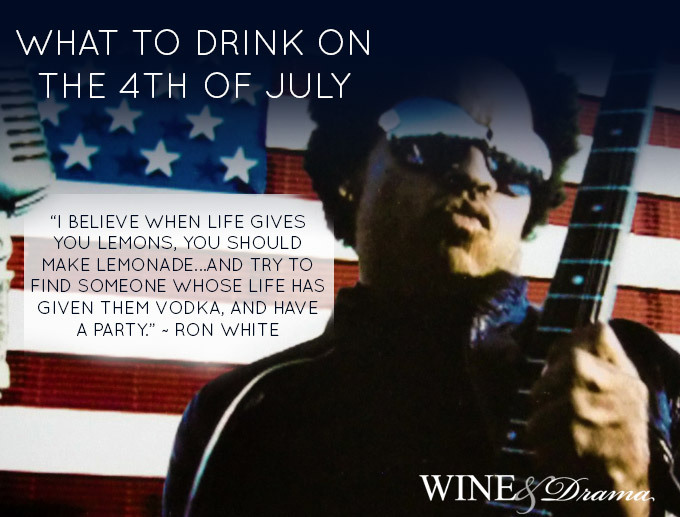 Have a big, loud, noisy, and full of booze 4th of July blowout. Then you recover the next day alone. As far as party menus – sorry love, I cannot spend my days on Wine & Drama planning meals. I do enough of that in my offline life. Scrambled eggs for dinner anyone? Here’s the Wine & Drama approved easy peasy drink menu for your next barbecue. Tell Bobby Ray to bring the beer. Tell your mother-in-law to leave that potato salad at home and bring you some fruit salad instead. 14 Hands Merlot made by the 14 Hands Vineyard in Columbia Valley, Washington and full of aged French oak and blackberries. The blend is Merlot, Cabernet Sauvignon, Syrah, Grenache, and Cabernet Franc. The particular vintage I drank is from 2011. It is juicy without being overly sweet with an earthy finish. The wine holds in own in blackberry notes followed by mocha and toast. 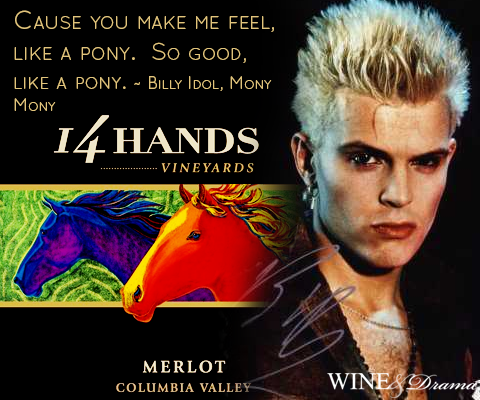 14 Hands Merlot is a deep and complex wine that doesn’t overwhelm. The finish is slightly dry and the tannins are definitely noticeable but delicately structured. I love this wine. Although at the current rate of consumption, I’ll have move into the 2012 vintage. I wish I felt as free as the wild horses that once roamed the Columbia River Valley and measured 14 hands tall. Run free you beautiful gorgeous beasts. Run free. At around $12 a bottle 14 Hands Merlot plays nicely with everyone. It pairs well with burgers, hot dogs, Italian sausage, flank steak, and anything else you decide to throw on the grill. Cupcake Prosecco mmmm…Prosecco. I love this Prosecco the way Homer Simpson loves glazed doughnuts. Cheaper than its more costly French stepsisters, this sibling of champagne gives you the fancy fizziness you love at a fraction of the cost. You can score it for around $9 a bottle. 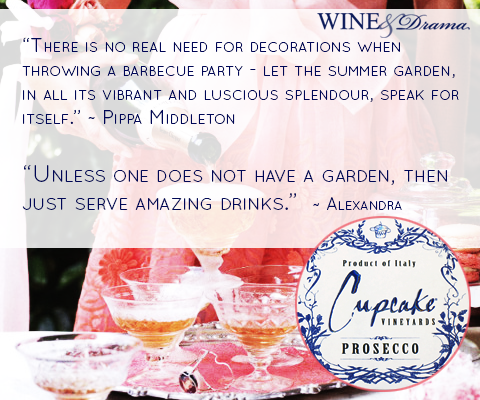 Cupcake Prosecco is made from 100% Glera grapes an old variety of grape that has DOCG status. What’s DOCG status? You want this label on your Prosecco. It’s a quality assurance label that means that the grapes used come specifically from the specified region. In this case the Veneto region of Italy. I’m a big fan of Cupcake Vineyards wines. Cupcake Prosecco has finely structured bubbles and the fizz hints at notes of white peach, pink grapefruit, and creamy lemon meringue pie. Keep Cupcake Prosecco on ice at all times. Prosecco is meant to be enjoyed and not saved. The lovely mouth feel of sparkling lemon with hints of cream taste delicious. So while it’s not a Grand Cuvee Champagne it’s definitely excellent for everyday celebrations. Isn’t that what 4th of July parties are about? Serve it with your famous fish tacos, grilled tilapia, three bean salad, and grilled corn, just call you fancy cause you know where it’s at. Nolet’s Silver Dry Gin Stunning in its imposing dark green and silver bottle Nolet’s Silver Dry Gin made a gin drinker out of me. However, I’ve been converted to the dark (err…gin) side. I love a good mystery, along with dark chocolate covered pretzels, and David Beckham in his underwear. The botanicals used to make this gin include: Rose, raspberry, and peach. What makes it different is the absence of juniper. And what makes it special is beneath layers of flowery scent, lies smooth, easy drink-ability. Now at your 4th of July soiree, if you have a friend or two that you really like coming over to party, give them a glass of Nolet’s over ice with tonic water and two limes. They will thank you later. It’s supremely drinkable and smells like an English rose garden. Note: If there’s no one really special at your 4th of July you need better friends. This gin is pricey at around $50 a bottle. If you don’t want to play nice and share you can always use vodka or tequila instead of the gin. Check out larger national chain liquor stores since Nolet’s often hides out there. Nolet’s is 47.6% proof, yes it’s close to rocket fuel – but you’ll have a nice buzz. Let your other half worry about the cheese melting outside on the food table. 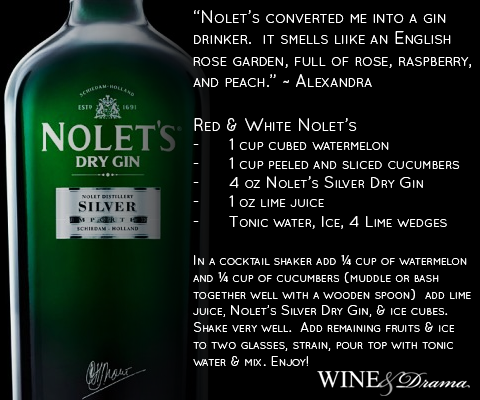 In a cocktail shaker add ¼ cup of watermelon and ¼ cup of cucumbers (muddle or bash together well with a wooden spoon) add lime juice, Nolet’s Silver Dry Gin, & ice cubes. Shake very well. Pour mixture through strainer top with tonic water. Stir well and enjoy! Now you have three easy drink options that will make you look like you have been planning this party for weeks. Keep drinking until everyone goes home. Have a happy and very safe 4th of July!